Fiber optic cable and fiber optic data transmission technology revolutionized data transfer in the late 20th century. In recent years it has become apparent that fiber-optics are steadily replacing copper wire as an appropriate means of communication signal transmission. Fiber optic cables are the medium of choice in tele communications infrastructure, enabling the transmission of high-speed voice, video, and data traffic in enterprise and service provider networks. 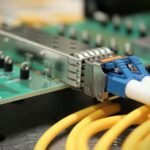 Depending on the type of application and the reach to be achieved, various types of fiber may be considered and deployed. Single-mode fibers have a 8–10-micron glass core and allow for one data stream, or mode, to be transmitted over very long distances. Single mode fiber carries far more bandwidth, but in a narrower spectral width, than multi-mode fiber. Single-mode cable provides 50 times more distance than multimode cable does. Consequently, single-mode cable is typically used in high-bandwidth applications and in long-haul network connections spread out over extended areas, including cable television and campus backbone applications. Telcos use it for connections between switching offices. Single-mode cable also provides higher bandwidth, so you can use a pair of single-mode fiber strands full-duplex for up to twice the throughput of multimode fiber. Multi-mode fiber has a large-diameter core nd multiple pathways of light. The two most commnon are 50 micron and 62.5 micron. Multi-mode fiber can carry data encoded using multiple light sources, thus allowing for multiple data streams to travel over a single optical fiber. The downside of multi-mode is transmission distance and available data bandwidth. Multi-mode transmission is good over shorter distances such as bringing fiber to the desktop, adding segments to an existing network, and in smaller applications such as alarm systems. Although both can be used in the same way, 62.5-micron cable is recommended for premise applications (backbone, horizontal,and intrabuilding connections) and should be considered for any new construction and installations. 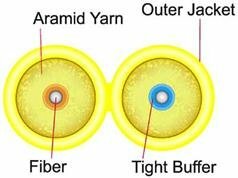 Single strand of fiber surrounded by a 900 um buffer then a layer of Kevlar and finally the outer jacket. Plenum is stronger and made to chare in fire versus riser is made to melt in fire. Riser cable is more flexible. Two single strands of fiber optic cable attached at the center. Surrounded by a 900 um buffer then a layer of Kevlar and finally the outer jacket. This compact building cable consists of individual 900µm buffered fiber, is smaller in size and costs less than breakout cable. Connectors may be installed directly on 900µm buffered fiber at breakout box locations. This cable consists of several simplex tight buffer fibers contained within an outer jacket. 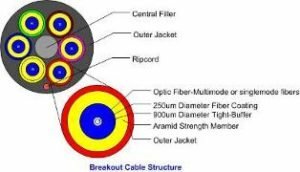 Breakout cable enables the quick installation of connectors onto 2+mm robust jacketed fiber. A coherent optical fiber bundle in which the configuration is flat rather than round, giving an output in a line. Fiber optic ribbon cable is available bare (without a jacket or Kevlar and also available with a plenum jacket or riser jacket. A typical ribbon has 12 color coded fibers and cables can be made with multiple ribbons. The jackets on ribbon cable are oval and can be broken out into fanout assemblies providing individual single connectors or using a MTP connector for multiple fibers being terminated with one connector.